Author's note: I orginally wrote this article several years ago in response to the puzzled looks I got when I was telling my friends (I was 22 at the time) about value investing and this guy in Omaha, Nebraska that was beating the pants off Wall Street practicing it. Fact: Between 1984 and 1999, a great bull market in America, 90 percent of mutual fund managers underperformed the Wilshire 5000 Index, a relatively low bar to beat. Ninety percent. Think about this for a moment. Only one out of ten “expert” mutual fund managers generated a return higher than that of the overall general market. Why does this happen? How is it that an overwhelming majority of intelligent professionals fail to produce a par result for their investors? The answer is two-fold: First, mutual fund managers tend to focus on short-term results and second, they tend to follow the herd. Mutual fund managers define their investment strategy with particular styles such as “small-cap value” or “small cap growth” to isolate the parameters that guide their portfolio selections. Any business that does not fit into the particular investment focus of the fund is screened out, regardless of its suitability for investment. The reason mutual-fund managers limit themselves to a particular class of equities is doing so appears rational and is therefore seen as the safest option. Who wants to ever appear irrational? This rationality (or lack thereof) is how mutual fund managers are able to justify their performance to their investors. Investors, wanting evidence that a mutual-fund manager’s decisions are reasonable, compare his decisions and performance with his peers. Mutual fund managers, knowing this investor behavior and anxious to protect their jobs, simply mimic their peers. This mimicking destroys whatever informational advantage they had leading to a shortage in investment possibilities and any informational advantage they had to begin with. As John Maynard Keynes wrote in The General Theory of Employment, Interest and Money, “Worldly wisdom teaches that it is better for reputation to fail conventionally than to succeed unconventionally.” What does all this say about mutual fund managers? That, in their goal of wanting to do what seems to be safest, they follow the crowd, resulting in performance below that of the general market by sticking to the same investments as their peer groups. Fortunately for investors, they have some options: Two options are index funds and what legendary investor Warren Buffett terms “super investors.” While the focus of this article is on the latter, a simple word on the former. Index funds are a great way to mimic the market without the necessary (sometimes outrageous) fees of a mutual fund. These low cost passively managed funds are, in general, far superior investments to mutual funds in many asset classes. However it is possible to have consistent marketing beating returns—by a healthy margin at that. When you think about trouncing the market, names such as Bill Ruane of the famed Sequoia Fund, Warren Buffett of Berkshire Hathaway, Peter Lynch of Fidelity, Walter Schloss, and Rick Guevin come to mind. Mr. Guevin never attended business school; Mr. Schloss never even went to college (I am not suggesting avoiding an education, something this author values tremendously, but merely to suggest that a pedigree MBA does not necessarily give you an advantage). Some of these names stand out more than others, but all of them and dozens like them have amassed equally astonishing performances year after year through bull and bear markets. And they did it in their own way. Walter Schloss owned stocks that Bill Ruane did not own that Peter Lynch did not own and so forth. The common thread amongst these super investors is their relentless pursuit for quality investments at attractive prices, otherwise known as value investing. Warren Buffet beautifully illustrates this idea as “buying dollar bills for fifty cents.” This discipline, coupled with patience and total lack of emotion from the daily market swings, has served these investors amazingly over decades. Ben Graham, the dean of value investing and a mentor to the some of the greatest investors, has said “investing is most prudent when it is most business-like.” A simple concept, but one that very few mutual fund managers practice. When you purchase a home, you hunt for a good price, safety, and a quality neighborhood and neighbors. You do your research and then purchase the most attractive home giving strong consideration to these factors. Investing and investment managers must be the same way, so as not to be mistaken for speculation. You want a bargain, safety, and a quality business and management. While I certainly cannot expect all investors to manage their own money—I would have no job or livelihood if that were the case—investors must demand market-beating performances from their financial gatekeepers if they are to justify the fees that they pay them to manage their money. Thankfully for us, we are fortunate to have some money managers and investors who don’t follow the herd. 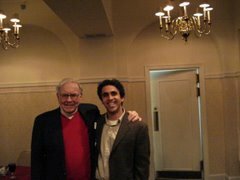 Sham Gad, a 2007 MBA candidate, is currently working to establish Gad Investment Partners, an investment partnership inspired by the work of Graham and Buffett. I welcome all comments and suggestions to shamgad@gmail.com. It is good to see another person who has planned to start a partnership firm on investing principles as laid down by Ben Graham. I am about to complete MBA in India and joining Citigroup Investment Research Division, however I am an absolute fan of Ben Graham and his timeless investing principles. I was glued to this style of investing after going through Intelligent Investor and Security Analysis by Graham. To talk about the success of this strategy I used Graham's principles to form a virtual portfolio of 30 stock in Indian stock markets, this portfolio gave a return of whopping 89% pa for 4 years ending recently!! Looking forward to hear from you as tnhere are not many like minded people in this field of value investing. Thanks for sharing this thought on investing. Do have any tips on how the principles of value investing can be easily applied by investors who want to go it alone? Also what do you take into consideration in starting up a partnership firm for investment purposes? Buffett's writings have taught me a lot over the past 12 years. I feel fortunate to have the world's greatest mentor. Hesham Gad is Managing Partner of Gad Partners Fund, an investment partnership inspired modeled after the 1950's Buffett Partnerships. The Warren Buffett of Mutual Fund Investing?